Seoul (AFP) - North Korea confirmed its test-firing of a precision-guided ballistic missile was "successful", the state-run news agency KCNA reported Tuesday, a day after the projectile landed in waters provocatively close to Japan. North Korean leader Kim Jong-Un supervised the launch of the "new-type precision guided ballistic rocket" -- the third missile test by the nuclear-armed regime in less than three weeks and carried out in defiance of UN sanctions warnings and US threats of possible military action. "The ballistic rocket flew toward the east sky where the day broke and correctly hit a planned target point... after flying over the middle shooting range," the report said. South Korea's military earlier said the Scud-type missile travelled eastward for 450 km (280 miles). Japan said it believed it had fallen into its exclusive economic zone, extending 200 nautical miles from the coast. The missile test triggered swift condemnation from US President Donald Trump who said it showed "disrespect" for neighbouring China, the North's sole major ally, which has sought to dampen tensions over Pyongyang's weapons programme. 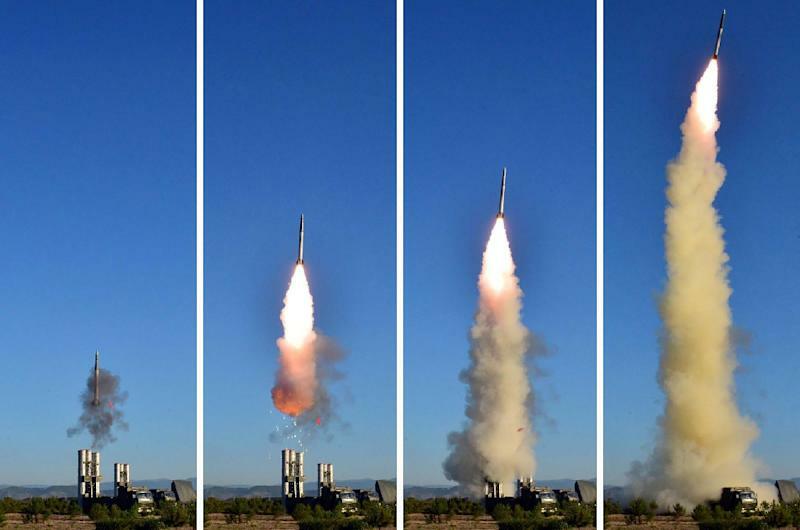 The launch was aimed at testing a weapon "capable of making ultra-precision strike on the enemies' objects at any area", the North Korean report said. "It also verified ultra-precision guidance correctness in the re-entry section," it said. "Whenever news of our valuable victory is broadcast... the Yankees would be very much worried about it and the gangsters of the south Korean puppet army would be dispirited more and more," the report quoted Kim as saying. It added that the projectile was showcased for the first time last month as part of Pyongyang's annual military parade to mark the 105th birth anniversary of the regime's founder Kim Il-Sung. But China has made it clear that the push for talks -- and not more sanctions -- is its priority. On Monday it pleaded again for dialogue. "We hope that related parties can remain calm and restrained, ease the tension on the peninsula, and bring the peninsula issue into the right track of peaceful dialogue again," the Chinese foreign ministry said. The US has said it is willing to enter into talks only if the North halts its missile and nuclear tests. Several rounds of UN sanctions have done little to stop the isolated regime from pushing ahead with its ambition to develop an intercontinental ballistic missile (ICBM) that can deliver a nuclear warhead to the continental US.